What an invitation the Risen Jesus gives Peter on that beach in Galilee - "Come and have breakfast"; and what a call he then issues - "Come, follow me"! 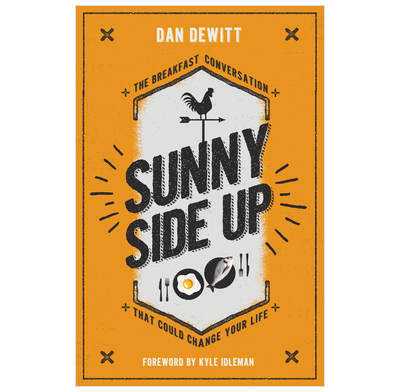 As Dan DeWitt says, if we take this breakfast conversation to heart, it can radically change our lives. I have always loved John 21 and preached on it many times. Jesus’ restoration of Peter is so encouraging because we all fail our Lord and need his forgiveness. Dan DeWitt expounds and applies this wonderful passage in a clear and accessible way that radically challenges us to love Jesus, care for his people and follow him regardless of the consequences. It is ideal for reading with new and young believers, but ought to be read by every disciple of Jesus as a spiritual health check. What a great little book! It is profound and challenging but also joyfully optimistic. It didn’t just tell me to follow Jesus, it helped me want to. This will really help anyone who is trying to work out what following Jesus actually means.